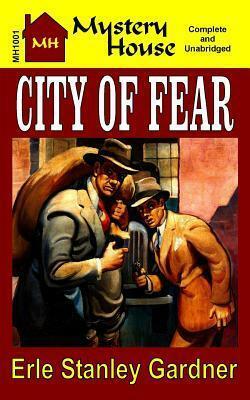 CITY OF FEAR-Steel and men, Hard Rock Hogan learned spanning a continent with rails; and he knew these men who ruled a city were no different, although their stell vomited from a chattering tommy. The stories in this book, all written by the creator of Perry Mason, Erle Stanley Gardner, originally appeared in the pulp ALL DETECTIVE MAGAZINE. Besides the story above, also included are: SMUDGE FINGERS OF FONG BOTH ENDS CATCH AS CATCH CAN MURDER APPRENTICE COMMITTEE OF ONE All of these stories can be found, in facsimile format, in Pulp Tales Presents #1: All Detective Magazine-for sale where you purchased this book or through our web site (www.PulpvillePress.com).